Car crashes are the leading cause of death among teenagers, with cell phone use being reported in 18 percent of all distraction-related fatalities in America. 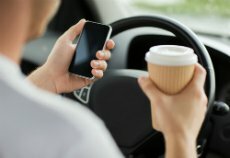 These scary statistics have led the National Highway Traffic Safety Administration (NHTSA) to create a campaign against distracted driving aimed at young adults. If you have teenaged children or you just happen to be up on current trends, you'll know that many young people use their cell phones to take "selfies", a nickname for self-portraits. It's come to the attention of law enforcement and safety advocates that teens are taking selfies and posting to social media while behind the wheel, some of them even use the hashtag #Ihopeidontcrash with their photos. Expressing that fear, even though it's disguised with a supposedly amusing hashtag, shows that these young drivers have an inkling as to how dangerous this practice could be.